Rosemary Carr, Olympia Kiwanis Boys Ranch PersonRosemary Carr was/is an Olympia, Washington Kiwanis friend and DSHS administrator. Rosemary Carr was the acting supervisor when the OKBR was audited in 1988. The audit found that the OKBR had been overpaid $79,000 to $120,00 by DSHS. The OKBR never repaid DSHS. Here is the text of the August 21, 1990, 8 page revised audit findings, conclusions and orders, from the DSHS Chief of the Office of Vendor Services, Rosemary Carr. The audit finding was that the OKBR owed Washington State $79,952.92. The OKBR never repaid that money. A copy of this audit report was sent to Rosemary Carr's boss, Leslie James. The attorney for the OKBR was Jerome Buzzard. The director of the OKBR was Tom Van Woerdan. Here's a photocopy of the August 21 1990, 8 page findings, conclusions and orders signed by Rosemary Carr, who was the Chief of the DSHS Office of Vendor Services. The OKBR never repaid Washington State, the $79,982.92 that Rosemary Carr said was owed. Here's a copy of the letter that DSHS Vendor Contracts Audit Supervisor Rosemary Carr sent to Tom Van Woerden on June 1, 1977 about the audit that her department was doing at the OKBR. Rosemary Carr hired her friends and rewarded her cronies. Sandra Libbey was superviser of the DSHS Office of Nursing Home and Hospital Audit section. Rosemary Carr was Sandra Libbey's boss. There were numerious friends of Rosemary and Sandra's in that DSHS 36 person audit section, including 3 married couples (6 people). 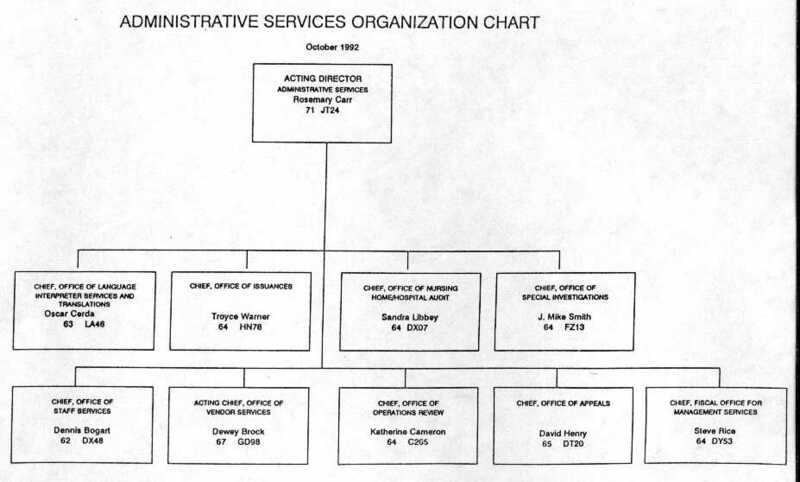 Rosemary Carr was acting director of DSHS Administratives Services after the DSHS Office of Operations Review did an audit of the OKBR in 1988. Rosemary Carr sent a letter to Jerome Buzzard on Aug. 17, 1990 about an audit of the Olympia Kiwanis Board Ranch. Rosemary Carr was mentioned in Art Cantralls' OKBR statement to the Wa. St. Patrol, about his involvement with the OKBR. Here's Rosemary Carrs' 1995 job title and salary when she worked at DSHS. Rosemary Carr is in the 49 page index (350kb) of 5,223 pages of documents that the WSP collected about the OKBR. Anybody can order any of those public documents by following the instructions on that page. OKBR attorney Jerome Buzzard wrote a four page letter to Jonell Blatt of DSHS in which the OKBR offers to pay $6,904.94 and house two boys free for a year, to settle the $79,000+ amount that DSHS says the OKBR owes Wash. St. Rosemary Carr is mentioned in the letter. OKBR attorney Jerome Buzzard wrote a two page letter on August 12, 1991 to Jonell Blatt of DSHS, in which the OKBR offers to pay $6,904.94 and agrees to provide one year of "free" service of the OKBR for two boys, to settle the $79,000+ amount that DSHS says the OKBR owes Wash. St. The OKBR also wanted some audit findings deleted. Helen Hannigan couldn't agree to having some audit findings deleted. Rosemary Carr supervised Haldor Finnerud, and Sandra Libbey.